This year, we have been using a new (to us) science curriculum, CKE Earth & Space, and are really liking it so far. I’ve been looking for years to find a science program that would work well to teach multiple ages at the same time and we have finally found it! The program is laid out so that there is a teaching time and a hands-on time. The kids also have notebooks that correspond with what they are learning. It’s working really well for us. They like the hands-on activities the best. The most recent lesson was on the structure of the Earth. 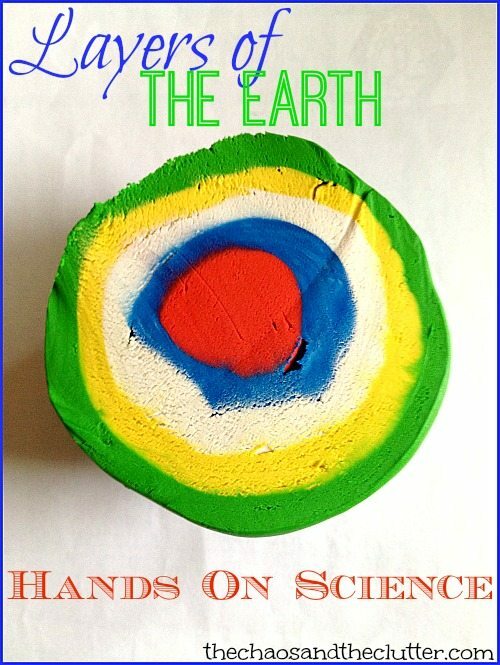 There were several hands-on activities suggested in the CKE book, including this one for demonstrating the layers of the Earth. 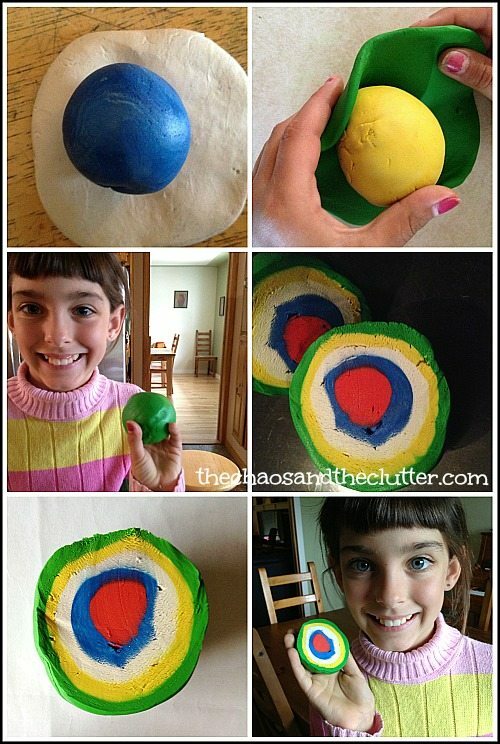 To create this 3D model of the layers of the Earth, you will need 5 colours of modelling clay and waxed dental floss. Form a ball to represent the inner core. We chose red to represent the intense heat of the inner core. Next, roll out a circle of another colour and wrap around the ball and roll gently. This next layer represents the outer core. Each subsequent colour will need more modelling clay than the last. You will need a colour to represent the lower mantle, another for the upper mantle, and the outer layer for the crust. You will not want to press the layers too firmly together so that the colours don’t mix. Once your ball of 5 layers of modelling clay is complete, use a piece of waxed dental floss to cut the ball down the middle, revealing all the layers underneath. The CKE notebook also includes a diagram to go along with this lesson that my kids were able to colour when we completed our 3D model. This way, they could use the same colours as the modelling clay that we used to further reinforce what they had learned. 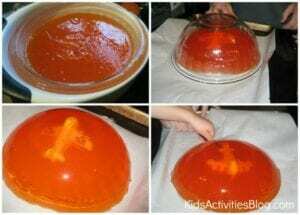 This week, we’ve been exploring through jello science. 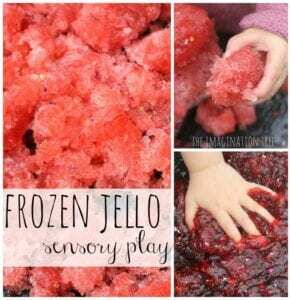 This started as a practical way for me to use all the extra jello I bought when attempting to make fingerpaint that flopped, but it ended with some really fun science experiments and more than a few giggles! The first science experiment we did was a slightly different take on the usual baking soda and vinegar chemical reactions eruption. This one has a colour mixing sensory twist. We started with vinegar, baking soda, blue jello, and yellow jello. I set out a clear baking dish and set two smaller dishes inside it. 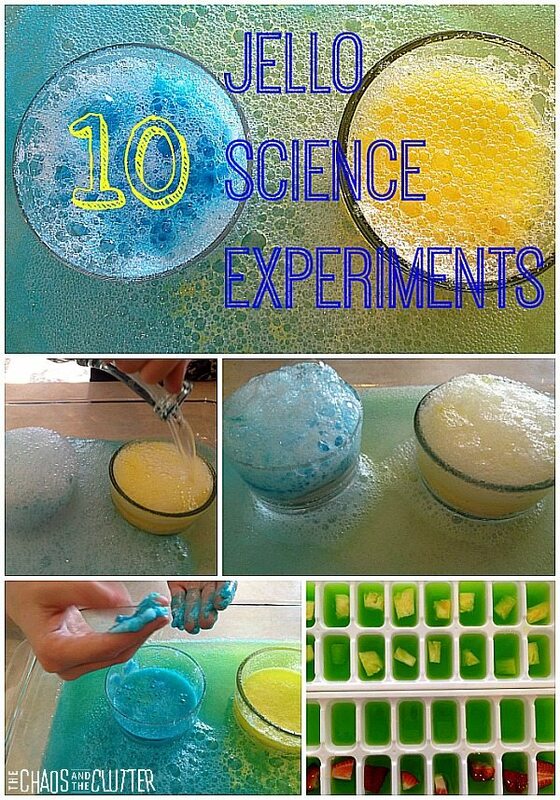 Into each of those dishes, I added baking soda and about half a packet of the jello and stirred them. Then I had Miss Optimism pour vinegar into the dishes and we watched it erupt. Since we used two primary colours, we had hypothesized that they would create a third colour once they mixed and sure enough, the blue and yellow created green. 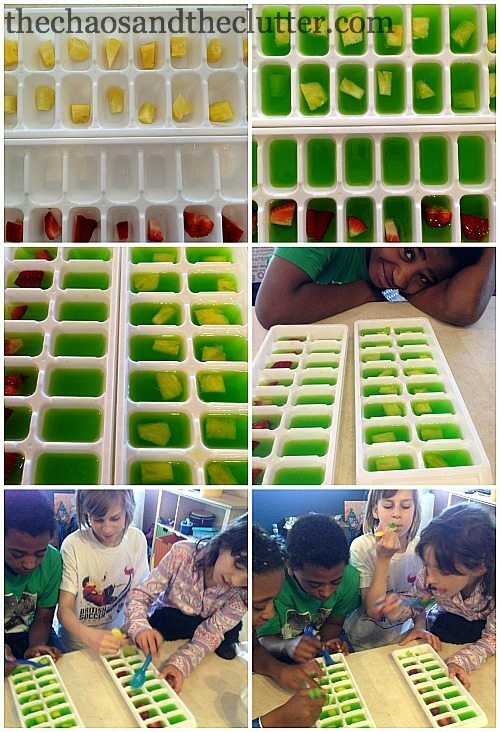 This jello science experiment soon turned into a sensory experience. As Miss Optimism put it, “it’s gooey, like wet sand”. She played for more than half an hour in the sensory goop, playing until the liquid was entirely green. 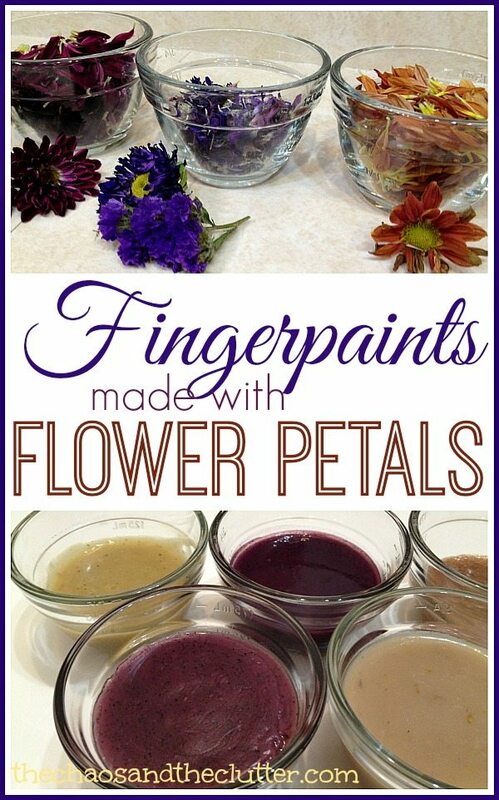 This hands-on learning activity is great for preschoolers up to elementary schoolers. It also makes a simple science fair project. 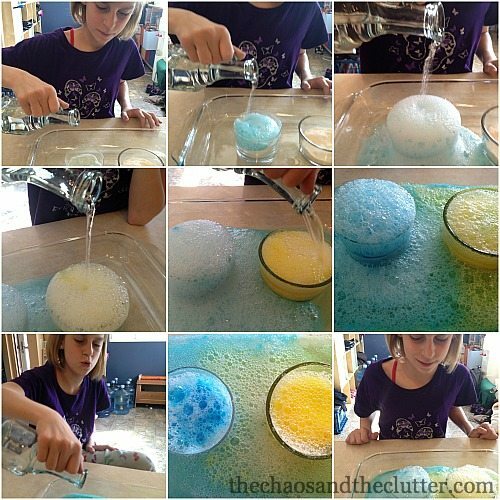 This science experiment is one of many awesome activities that you can find in The Sensory Science Book Volume 1. 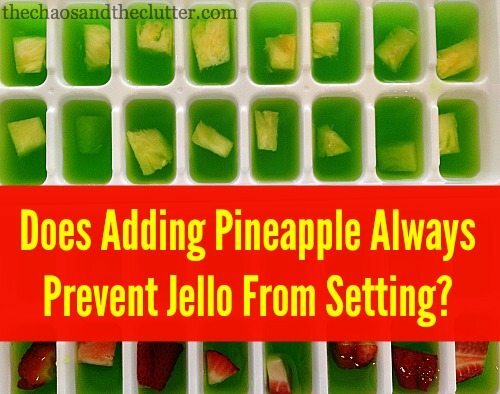 The next jello science experiment we did was to see if adding pineapple will always prevent jello from setting. Einstein had read on the box of jello that adding kiwi or pineapple will prevent jello from setting. We began by adding pieces of fresh pineapple to one row in an ice cube tray. I then roasted pineapple and we added a row of cooked pineapple to the tray. We did this to see if cooking the pineapple would make a difference as opposed to using the fresh fruit. We mixed up jello according to the package directions and poured it in the tray. In another tray, we set out one row of strawberry pieces to see how the jello would react to that fruit and in the last row, added nothing so that we could use that row as our control. We added jello to that tray as well and put both trays in the fridge to set overnight. In the morning, we found that all the rows had set except the row with the fresh pineapple which was still green liquid. 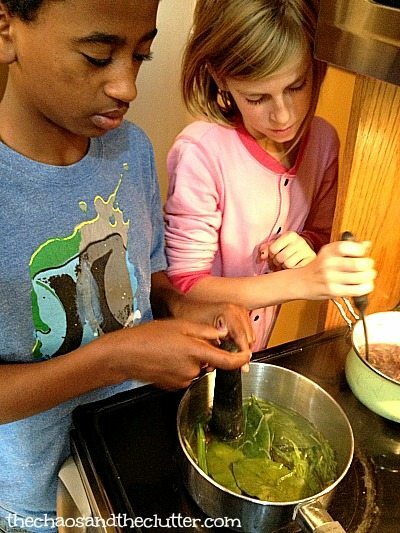 This activity was kitchen science at its best. The kids ate the results just to be sure they were accurate! We read about how pineapple has an enzyme that breaks down protein and therefore prevents jello from setting. We deduced that cooking the pineapple had broken down the enzymes or caused them to be inactive which allowed the jello with the cooked pineapple to set. Strawberries do not contain bromelain and do not affect the structure of jello. With our one remaining Jello packet, the kids took all of our fun ice cube tray moulds (Titanic, Lego blocks and Lego mini fig) and made themselves some fun shaped jello to eat! 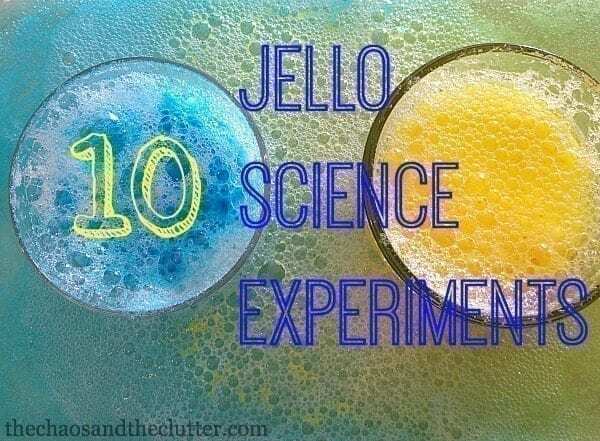 This isn’t the first time we’ve explored science with the help of jello. 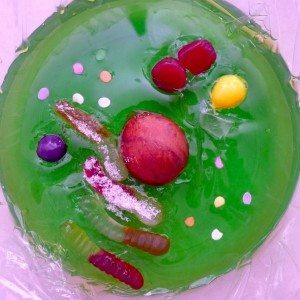 A few years ago, we made this edible cell out of jello for one of the science units we were studying. 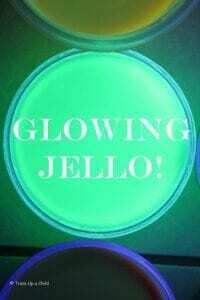 Learn Play Imagine has a super cool Glowing Jello Experiment. 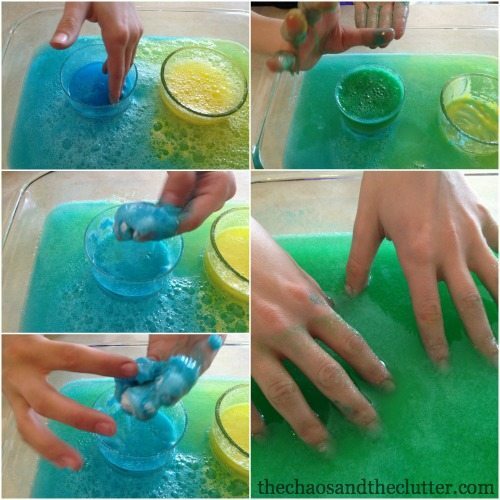 Experiment with changes in matter with frozen jello sensory play from The Imagination Tree. Momma’s Fun World did a fun experiment with jello egg science. Kids Activities Blog offers a really great idea for teaching kids about turbulence on planes. This would be especially good for kids who either have a fear of flying or who have never been on an airplane. Science to conquer fears! 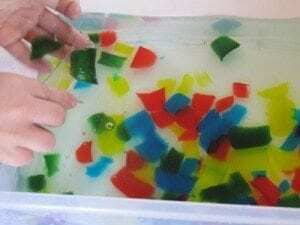 Teach Preschool offers a wonderful hands-on science experience with The Wonders of Bright and Colourful Gelatin. 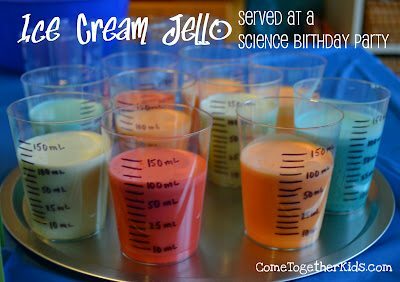 Science Buddies has a really awesome centripetal force jello experiment. I actually wrote out the steps and considered doing this with the kids but it is a bit advanced for where my kids are at. It may be one we do in the future though. This ice cream jello from Come Together Kids is so cute! I love the way she made the cups! 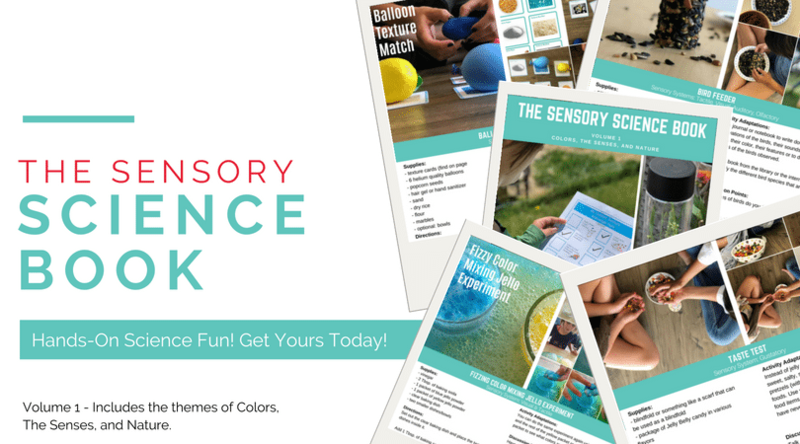 If you are looking for other fun and easy science experiments, check out The Sensory Science Book that will get kids excited about science! Science can be fun and it doesn’t have to be complicated. 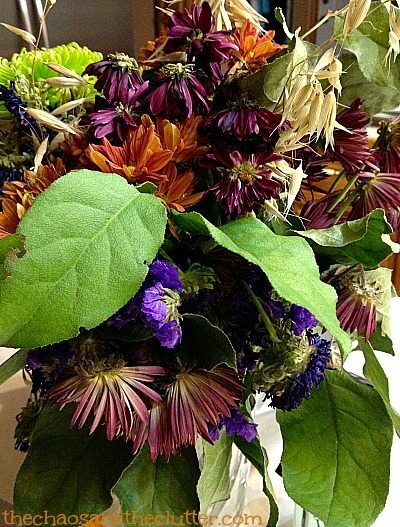 This simple experiment allowed me to introduce several new science concepts to the kids. For this experiment, you only need 2 items: a container (we tried using a glass container and a tall plastic cup and we preferred the glass container as it made more noise which contributed to the fun factor!) and a long string of plastic beads or a beaded garland. You can achieve this by using beaded necklaces (I bought mine at the dollar store) and cutting them once to form a single strand and then tying them together to create a long strand. Put a piece of tape on each end of your beads. I used clear packing tape but I’m sure that any type of tape would be fine. The experiment is so simple. 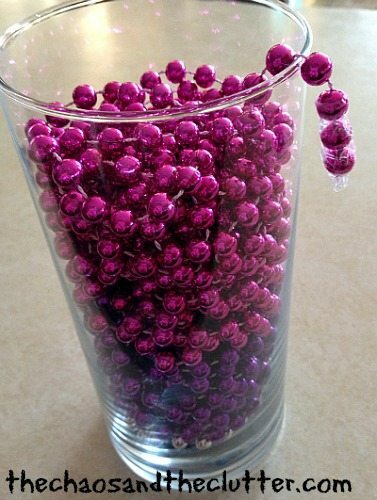 Place the strand of beads into the container, ensuring that it doesn’t get tangled, hold it up and give the end of the strand a slight tug, causing the strand to begin falling. Before long, instead of falling straight down, you will see the beads begin to arch upwards. It is so cool! This experiment depicts Newton’s law of inertia (Newton’s first law) which is basically that objects at rest have a tendency to stay at rest while objects in motion have a tendency to stay in motion. I also used this experiment to talk to my kids about momentum. To give a further demonstration of momentum, I had them begin running and then suddenly told them to stop so that they could see that their body continued to propel forward. They found this to be quite a fun demonstration as well! 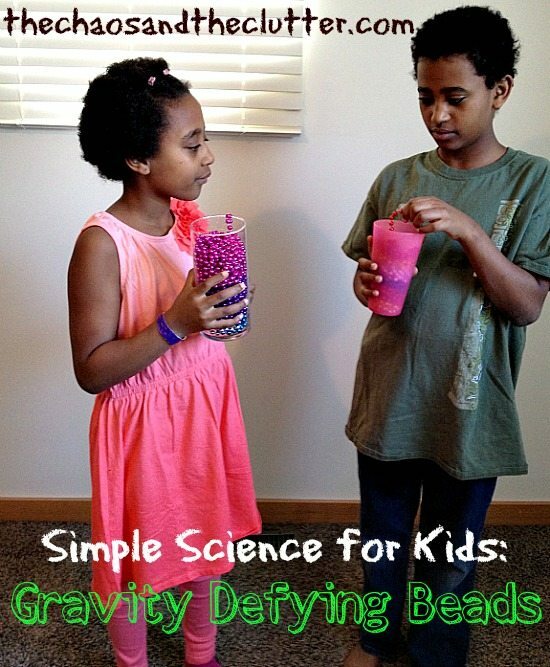 This video shows our gravity defying bead experiment. First, Snuggle Puppy is holding the container and then Granola Girl (who has a really funny reaction to watching the beads go higher and higher!). I’ve also put Granola Girl’s in slow motion to better show how it works. If you are interested in other easy hands-on science activities, you may want to follow my Simple Science board on Pinterest or check out our other simple science for kids ideas. Science is not my favourite subject to teach. To be honest, it’s hard to even wrap my brain around some of the more advanced concepts so other than nature studies and Science Fair projects, we do very little science in our homeschooling. 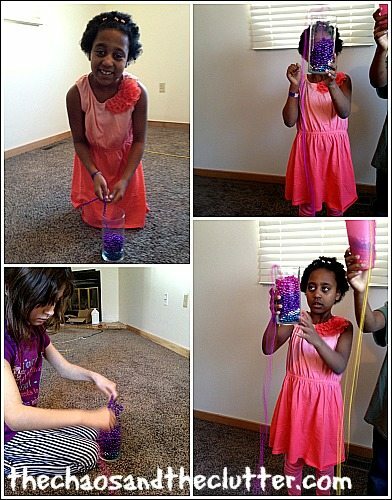 Last weekend, our girls were invited to a birthday party with a science theme. The birthday girl’s dad is a friend of mine who is a high school Physics teacher and he is PASSIONATE about SCIENCE! I stayed and watched and I have to admit that his enthusiasm was infectious and by the end of the party, I began to believe that maybe science could be fun and that maybe I could be capable of teaching it. 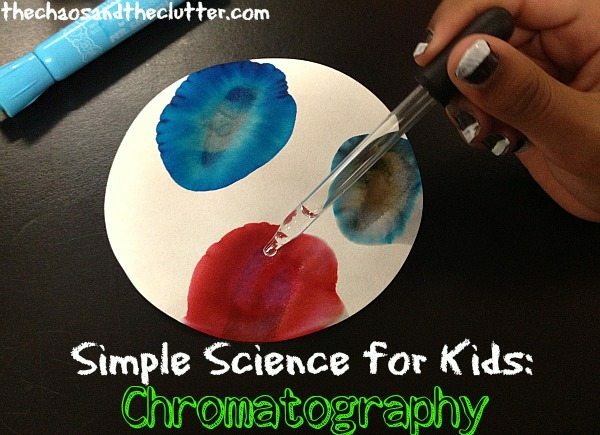 One of the hands-on activities he had the kids do was a lesson in chromatography and it was one that I later repeated with all my kids at home. 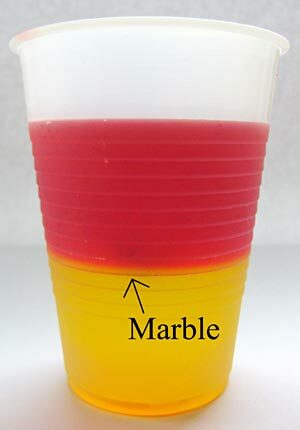 This easy science demonstration can be done with materials you likely have in your home already. All that you need for this experiment is filter paper, markers, droppers, and water. 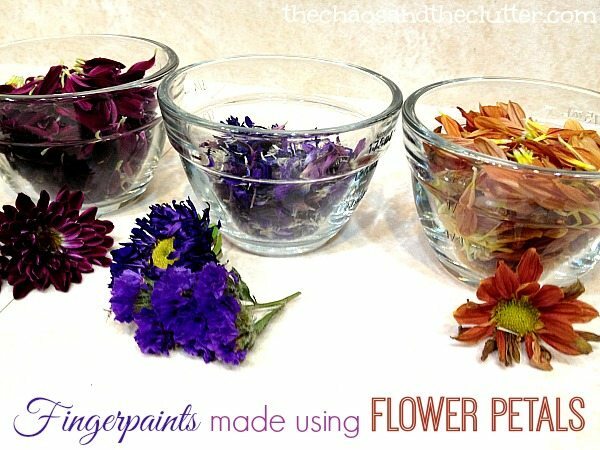 It does works best on filter paper but you can also use coffee filters or paper towels. We tried with each of these and they all work well enough to demonstrate the principle, although filter paper did give the most clear results. For the water, we used droppers, a spray bottle and a paintbrush and all of them worked equally well for distribution of water. 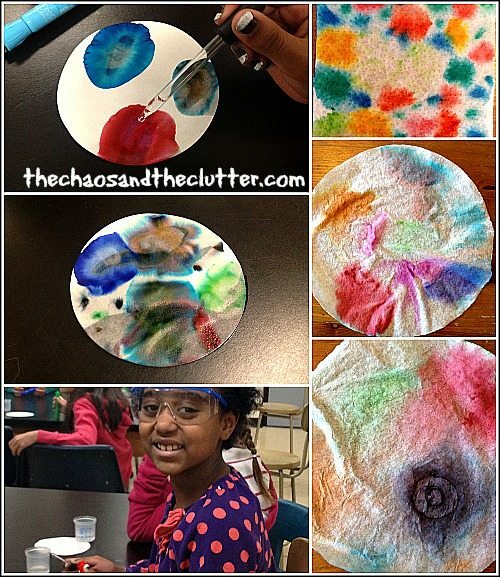 Have the kids colour an area on the filter paper and then add a few drops of water to that area. Have them observe what happens to the colour. They will be able to see that not only does the colour spread, it separates into the colours that make up that particular colour. Be sure to have them try using a black marker as it separates into several colours. Chromatography is the separation of mixtures so this simple experiment is an easy introduction for kids to that concept and also gives further study into colours and shades. If you are looking for more easy science ideas, you may want to follow my Simple Science board on Pinterest. This post is sponsored by Anatomy Now and I was compensated for my time, however the experiences and opinions are honest and all my own. For more information, please see my disclosure policy. We do a lot of hands-on learning in our homeschool. I find that the more hands-on the activity is, the better my kids retain the information and the more I am able to hold their attention. We have used 3D models for some of our learning already such as the edible cell we made last year and the human ear model we used when doing a study on the senses, but I plan to use them even more next year when we do a more in-depth study of the human body. There are 206 bones in the human body, and both you and your kids might be daunted to try learning about them all. Then there are all the muscles, organs, and physiological processes that should be covered in any thorough anatomy lesson plan. Whether your child is an aspiring doctor or is just curious about how the human body works, dynamic anatomy lessons are a valuable part of their science curriculum. While anatomy lessons can easily turn into exercises in rote memorization, they can be so much more engaging if you make them interactive for your children. One great way to pique your kids’ interest is to give them access to different anatomy models. No, you don’t necessarily have to bust out a full-sized skeletal model (unless you happen to have one on hand), but you can show your kids anatomy models of just about anything, from regions of the brain to the structures of the eye to anything else that interests them. Sure, it might be tempting just to dust off your high school anatomy textbook (because surely you held onto it, right?) instead of tracking down anatomical models. Stick solely with a textbook, though, and you risk your children not getting the most out of their science lessons. If your child is a visual or tactile learner, using anatomy models may be a much more effective way to help them understand how the body works than just having them read a textbook. Studies have shown that memories are stronger when you engage multiple senses at the time of learning. Allowing your kids to play with anatomy models in addition to hearing about how the human body works will help the lesson stick. Kids (and let’s face it, adults too) tend to get bored doing the same types of activities all day. If they’ve spent the morning doing math or reading exercises and you sit them in front of an anatomy textbook in the afternoon, they’re not too likely to be fully receptive. Learning through anatomy models can give both you and your kids the chance to add variety to your curriculum. Many anatomy models can be deconstructed so that your kids can look at individual bones or tissues and see how they fit together. Being able to break down different structures can be a valuable tool, especially for younger kids who might have trouble grasping how different parts of the body work together. Using anatomy models may spark an interest in science that your kids will continue to pursue for years to come. Anatomy models make great supplementary teaching tools. 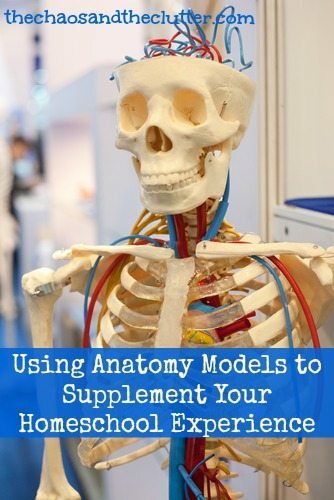 You can buy an anatomy textbook or print off web resources to start with, then show your kids models so that what they’ve been learning about on paper becomes three dimensional. Anatomy models are also great for quizzes; you can start off by taping labels to different parts of them while your students learn their names, then later take the labels off and see if your kids can identify different anatomical features on their own. You might also consider posting anatomical charts in whatever room you teach your kids, so that they can refer back to the charts while studying the models. Luckily, the advent of the Internet has made it incredibly easy to shop for and purchase anatomy models online. Anatomy Now offers 238 different human anatomy models, so it’s safe to say you can find an anatomy model for just about any lesson. 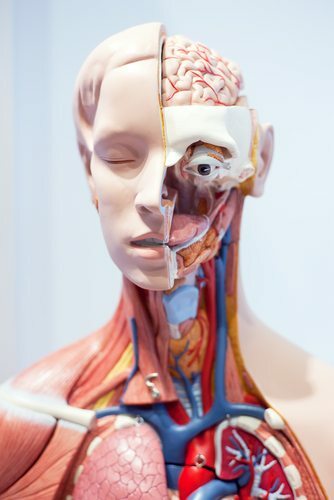 If you want to make the most of your purchase, consider making plans with other homeschooling parents in your area to buy different anatomical models, then switch when you’re done with them. If you have kids of different ages, you can also hold onto these sturdy anatomy models and reuse them in a curriculum several years down the road. And, of course, Anatomy Now offers full refunds if you’re not completely satisfied with one of their products, so you don’t have anything to lose.